I haven't done any pregnancy updates this time. This will probably be the ONE post about it. More so than not making it a priority, I feel like I JUST wrote about pregnancy and haven't felt like documenting it, haha. So I thought I'd write a little before I actually have this new baby. Praise the LORD that I haven't had hyperemesis this time. Yes, I've been sick, and I still take medicine for it (Unisom + B6), but it's not much compared to the awfulness of HG. As soon as I found out I was pregnant again I prayed and prayed not to have it. God would have totally given me the grace to get through it if I did, but I thank Him every day that I don't. Because of that, I have been gaining weight at a much more normal pace this time! I'm 37 weeks now and have gained 30 pounds exactly. So not drastically different, but more steady and healthful for sure. Last time I packed on some pounds at the end to help him grow. This pregnancy has definitely seemed to go by faster since all of our thoughts aren't on the new baby. Sometimes I have felt guilty for how little I think of him compared to how I thought of Judah. I told Jordan that I feel badly that I haven't talked to him as much, but Jordan said that this baby actually hears more of my voice due to how much I talk to Judah throughout the day which is true. Now that it's getting toward the end it's really hitting me that we'll have another little buddy and I'm getting more excited to meet him! Last time we also had to do more to prepare for Judah's arrival going from nonparents to parents, so I also think it feels different this time since we already have most of the stuff we need. Especially since it's another boy which is super convenient for clothes and such! My sweet mom just threw me a baby "sprinkle" last weekend which made it much more real. We are loaded up on diapers and wipes now which is awesome! I feel more aware this time of how things will change when we have a newborn and I'm breastfeeding again. Since I know how we'll be more tied down, we've been doing a LOT of activities before I'm full term -- going out of town a lot, taking time as a couple, getting together with friends, saying "yes" to lots of things. It's been tiring, but I'm glad we've been taking advantage of this time. This time around I've had more aches and pains and have felt very pregnant quickly. My back and ribs have given me a lot of trouble this time. I remember having some of that before, but not like this. Tylenol doesn't help and the pain prevents me from sleeping. It's gotten a little better since the baby has shifted into a more helpful position, but I still do a lot of stretching, yoga, and heating pad time to help. I can tell that I've been swelling a little bit which is earlier that I did last time. And I feel less cute...I know that sounds dumb but just being honest. I think some of that has to do with being very pregnant at a different time of year and wearing clothes for warmer weather -- more exposure for my swollen self. We went to the beach last weekend with our small group and I thought I may feel self conscious in a bathing suit but it was actually the opposite. I felt even more comfortable than usual! Weird. Kinda makes sense though since I know that last time I was much more self conscious of my body AFTER having the baby. Which is something I need to go ahead and just let go of now for sure. Grace all around. For most of the pregnancy I've been pretty much emotionally numb, but in the last few weeks I've been MUCH more sensitive. Huge bouts of crying over mostly nothing. Poor Jordan. Even though it's unpredictable and not fun when I'm super moody, I actually prefer the emotion over a complete lack of it. I'll touch on this more later in another post I'm sure. This week I've hit nesting mode and now Judah's new room and the nursery are ready. I loved getting out those tiny newborn clothes again and getting itty bitty diapers ready. There are other things I'd love to do before he gets here but the essentials are taken care of. I am still in shock of what God has planned for our family. I never thought we'd be doing all this again so soon. I keep reminding myself that God made this kid for us to be his parents and in this exact timing. It is truly a gift albeit an overwhelming gift. We are thankful and scared. More confident in some things this time, less confident in others. Lots of different feelings. But so, so thankful. I enjoyed this update. 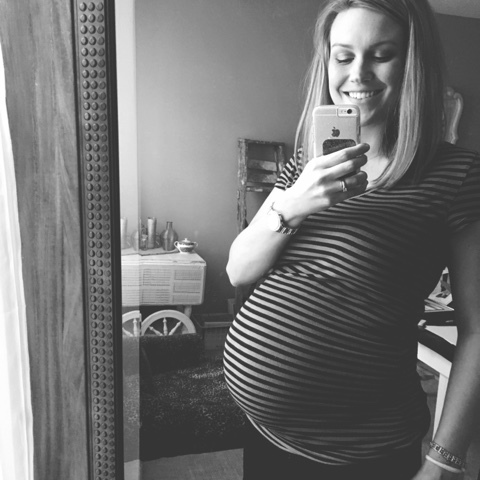 I'm 20 weeks pregnant with our first and have a few similar thoughts. I work full time and just haven't had the urge to think and plan for the baby like I feel I'm supposed to. I don't have that baby obsession like I think I'm supposed to. But I also keep reminding myself that God knows what he's doing. He has a plan for our family and He will guide me through this. Without keeping that in mind, nothing makes sense. And I feel like I'm not ready to be a mom and I'm not good enough to raise another human. But its not about me, is it? Love your updates and have missed your blogging! Thank you for sharing your heart! Those brothers will be close as can be. It's no joke though and is very hard. (My last two were 15 months apart.) But, when they hit two and three it will be so fun to watch them play and learn together. I can't wait to watch them grow! Hello, just wanted to see what bible you use? Thank you! Your pregnancy requires extra-special care, so follow your doctor's orders and try to relax. Thanks to advances in medical technologies and good prenatal care, you are more likely than ever to have a healthy pregnancy, delivery, and baby.